June is the sixth month of the calendar year, marking the end of the first half of the year, and start of the second half. The mid-year online sale, one of the largest online sales in China is coming with almost all major online shopping websites participating. Earlier in May, the online shopping websites had been finalizing their marketing strategy so that they could gain a large market share in the important mid-year sale, competing with other online shopping sites. Banggood, one of the largest and most popular Chinese retailers, is preparing to compete with other online shopping sites for the annual mid-year sale in June. The company was established in the year 2009, and in the past nine years, it has worked hard to greatly improve its customer support, logistics, and product quality. This has helped Banggood become one of the most popular online retailers for shopping for customers worldwide. It is not the first time for Banggood to hold the mid-year sale so it feels confident enough to satisfy its customers from worldwide by offering the latest high-quality products at extremely affordable prices and devoting a lot of resources and money to preparing for the sale. According to the CEO of Banggood, Zou Le, the online retailer is offering a wide range excellent discounts and free gifts on various products as part of the online sale. The company has upgraded the hardware, software, user interface and its customer service to meet the anticipated increase in orders during the mid-year sale. 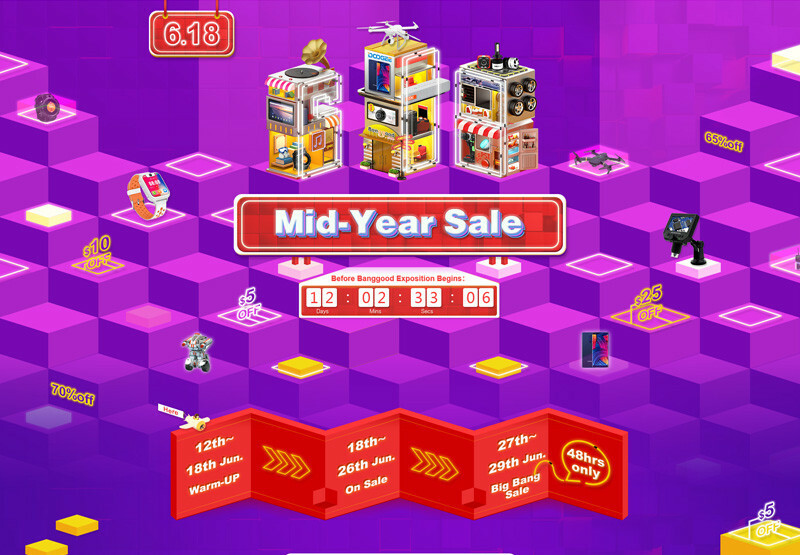 Officially Banggood’s mid-year sale is scheduled to begin on June 27 and end on June 29. However, it will actually start on June 12 as the part of the warming-up. During the sale, coupons for getting an 80% discount, free gifts, snap-ups and other promotional deals will be offered to help customers save money. Country-specific deals, activities, and promotions for Russia, Spain, India, Italy, and Portugal are also planned by Banggood. From the year 2009 onward, Banggood has been planning to make the mid-year sale, an annual event, holding it usually in the middle of the month of June. Banggood promises its customers, that it will work hard to improve its annual sale events so that loyal customers can look forward to getting a better deal every year while shopping online.